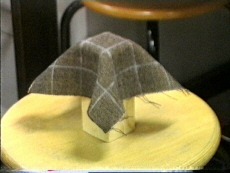 Several cloth modeling techniques have been proposed. Their main purpose is the realistic simulation of the garments of virtual actors for entertainment and advertising. In these areas, the main concern is to construct fast algorithms, able to produce impressive and qualitatively satisfactory draping of clothes. 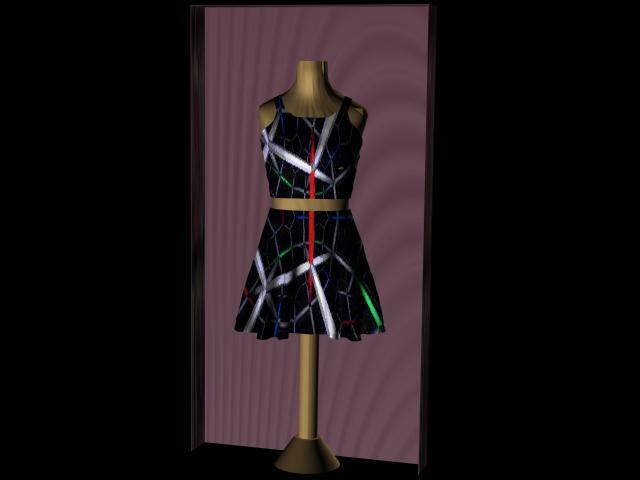 Other applications, as designing, manufacturing and selling real garments, call for a virtual draping which not only satisfies the human eye, but also closely mimics the real physical draping of clothes. From this viewpoint we have developed a modeling techniques that exploits physical characteristics of the real clothes, and we have obtained some result concerning the quantitative (and not qualitative) comparison between the draping of real clothes and their virtual counterpart. In order to be able to deal with several kind of clothes with different physical behavior, it is necessary to be able to change some parameters of the model according to some measures performed on the real cloth. One way for extracting significant empirical data is the Kawabata Evaluation System. It consists of a standard equipment, able to determine the relations between stress and strain for stretching, shearing and bending in both warp and weft directions, as well as other properties which do not concern draping. The cloths are modelled as discrete models. 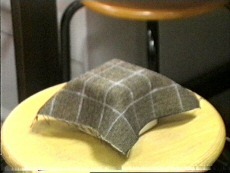 The general idea is to model small contiguous areas of cloth as interacting mass points constrained in a polygonal mesh. Particles are connected by strings. Internal forces are expressed in terms of the Kawabata parameters, external forces include gravity and friction and collision is also considered. The draping simulator consists of a system of differential equations that is solved using a Runge-Kutta method of the fourth order. The quality of the simualtion is evaluated comparing the virtual clothing with a real cloth; the position of reference points on the real cloth is acquired through a calibrated stereo camera. The best average error obtained for the different scenarios is between 2.3 and 3.5 mm, that is almost 1.5% of the patch size.